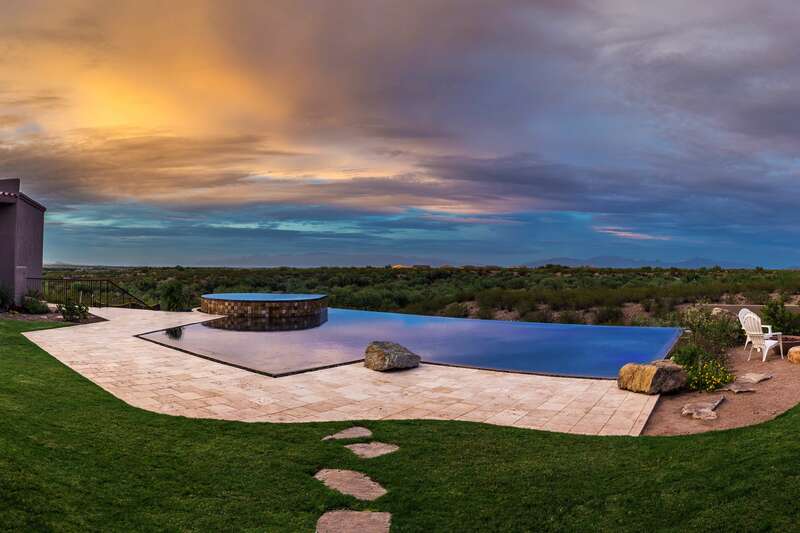 Our Tucson pool and spa design team have years of experience in planning, designing and building swimming pools and spas for Tucson homes. To view examples of our beautiful pool designs visit our gallery. From our free Pool Planning Guide to our 20 year reputation as a locally owned and managed Tucson pool and spa business, we are your reliable partner for the design and construction of your in-ground pool or spa. We have a vast amount of ideas on the best way to create a backyard pool architecture that works for you. Swimming pool styles vary greatly according to individual taste. We can show you ideas for pool plans from the extravagant to the affordable; from a simple playpool for children to an Infinity Pool with cascading waterfalls, soft romantic lighting and lush tropical landscaping. Take advantage of the warm desert climate in Tucson to turn the backyard of your home into your own private oasis with a custom designed swimming pool! Cooking and outdoor entertaining are changed forever when you can relax and enjoy your own Tucson pool and spa. Call our pool builders in Tucson today at (520) 293-5818 to schedule your free swimming pool design consultation or visit our showroom at 3321 N. Freeway Rd. Tucson AZ.